It’s those times, when the house is full of laughter, children are scrambling from one room to the next, the dinner table is filled with all of those you hold dear, that you realize a house becomes a home when memories are created there. I lived in one home for 40 years. From the time I was born until I moved to Georgia to be with my husband, I had only one home. My home was a small, but cozy little white house located smack dab in the middle of Gilbert, USA. It was across from the strawberry patch and the big windmill, and in front of the wheat fields. I loved playing in those fields when I was little. The wheat would grow taller than me and I could easily hide in the middle. Sometimes when I would get off of the school bus, I’d run into the fields, bend some wheat on the ground to make a bed, and do all of my homework and napping right there. I loved my little home. It was a very special place to grow up. When I moved to Georgia, my sweet boy and I bought a beautiful home in the foothills of the North Georgia mountains. We bought a home large enough to host family gatherings with three children, four grandchildren and all of our future grandchildren. I loved that we could all be together under one roof. Although I was in love with my new home, moving was extremely hard. It took a couple of years for it to really feel like I belonged there, and I felt like a left a piece of me in South Carolina. Over the past three years we have had the pleasure of hosting our children, grandchildren, friends and family in our home. It’s those times, when the house is full of laughter, children are scrambling from one room to the next, the dinner table is filled with all of those you hold dear, that you realize a house becomes a home when memories are created there. When you look at a painting hanging in the dining room and see where a spaghetti noodle still remained stuck to the corner after a spaghetti fight with cousins. Or you’re washing the bedding and you come across a little spilled chocolate milk from a sippy cup. Those are the good times. That’s when your house, finally becomes a home. There is no better place to be than home for the holidays. I couldn’t imagine a Thanksgiving without home cooked turkey & dressing, cranberry sauce and all of the sides and desserts! Along with the traditional holiday meals, our family loves seafood! 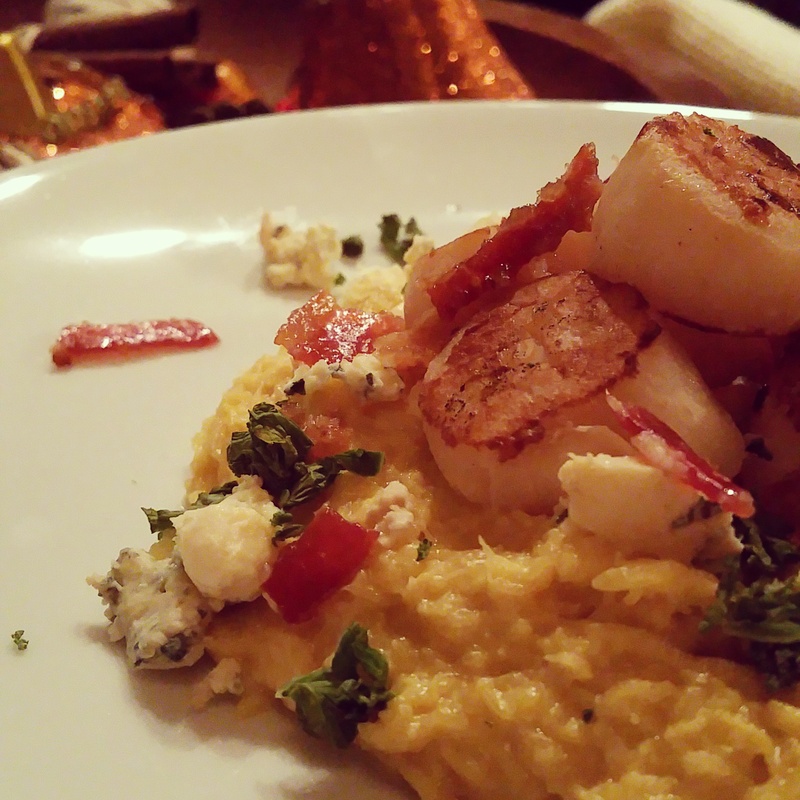 We always incorporate shrimp, scallops or lobster for our Thanksgiving Eve meal. Did you know the first Thanksgiving also incorporated seafood? True story! If it worked for the Pilgrims, it sure works for us! 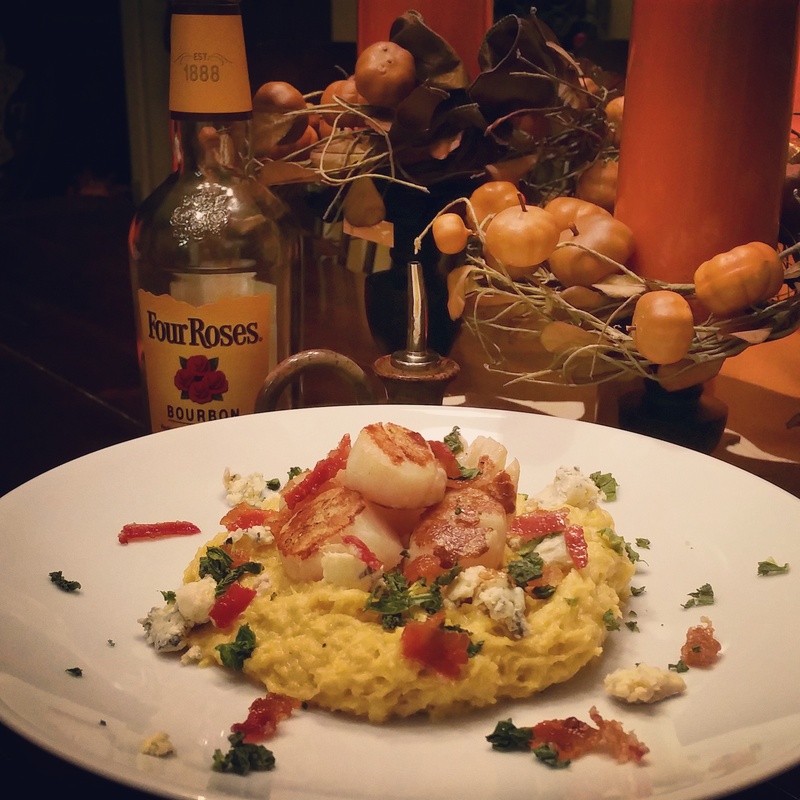 This year, with the help of Four Roses Bourbon, I’ve created a new seafood dish for our Thanksgiving Eve festivities. I’m so excited to have the kids, grandkids, friends and family at the house. There’s nothing like coming home for the holidays. Drizzle cut sides of squash with olive oil, and lightly salt & pepper. Place face down on a parchment paper lined baking pan. 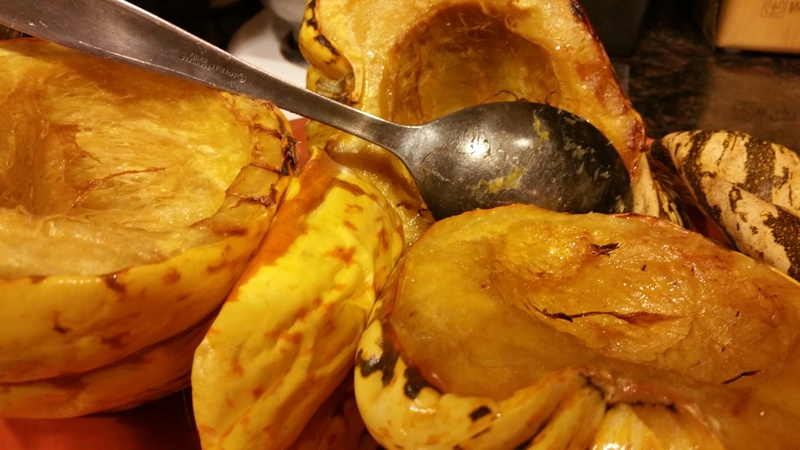 Roast squash for 45 minutes at 375 or until squash is fully cooked. Allow to cool, then scoop flesh from squash into a bowl. Add heavy cream, 2 tbsp. Four Roses Bourbon, Thyme and additional salt & pepper. Mash or whip until all ingredients are well incorporated. Set aside and keep warm. For the candied bacon, mix pecans, brown sugar and 1/4 cup Four Roses Bourbon in a bowl. 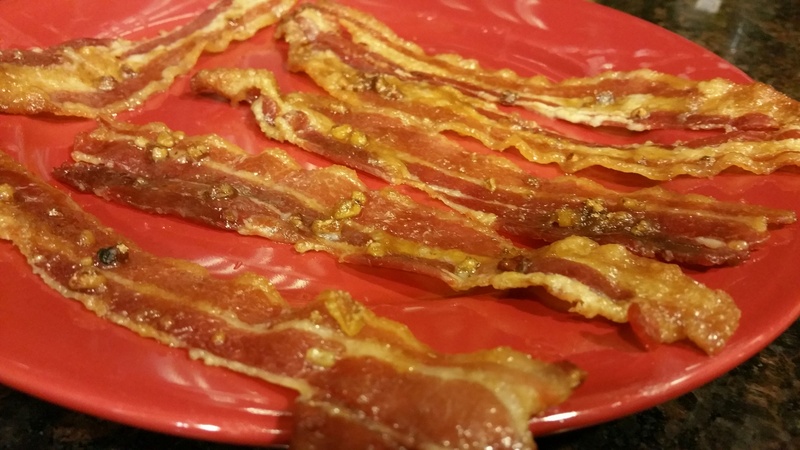 Coat each slice of bacon with the sugar mixture. 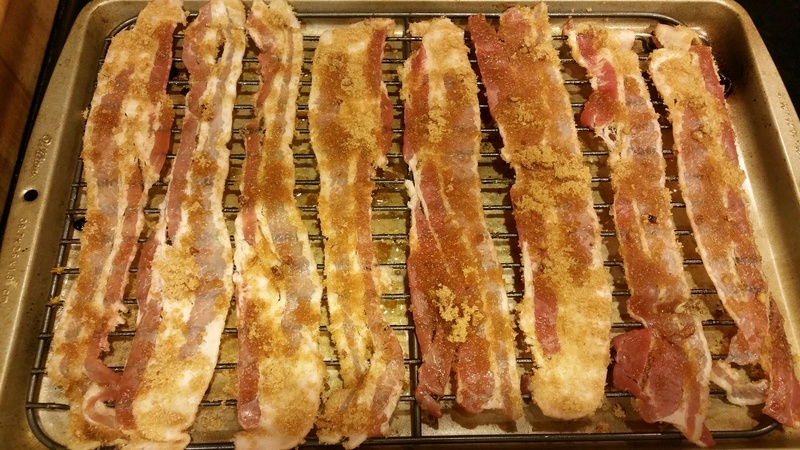 Place on a baking sheet and bake at 375 for about 15 minutes or until sugar mixture has melted and “candied” the bacon. You want the bacon crisp, but be careful not to burn. Set aside to cool. Drizzle about 1 tbsp. olive oil in a skillet and bring almost to smoke point. Make sure scallops have been dried well with a paper towel. Add each scallop to the pan, being careful not to crowd. Allow scallops to cook on high heat for 1 1/2 minutes each side. The scallops should have a nice golden crust, but remain translucent in the center. Remove from heat and set aside. 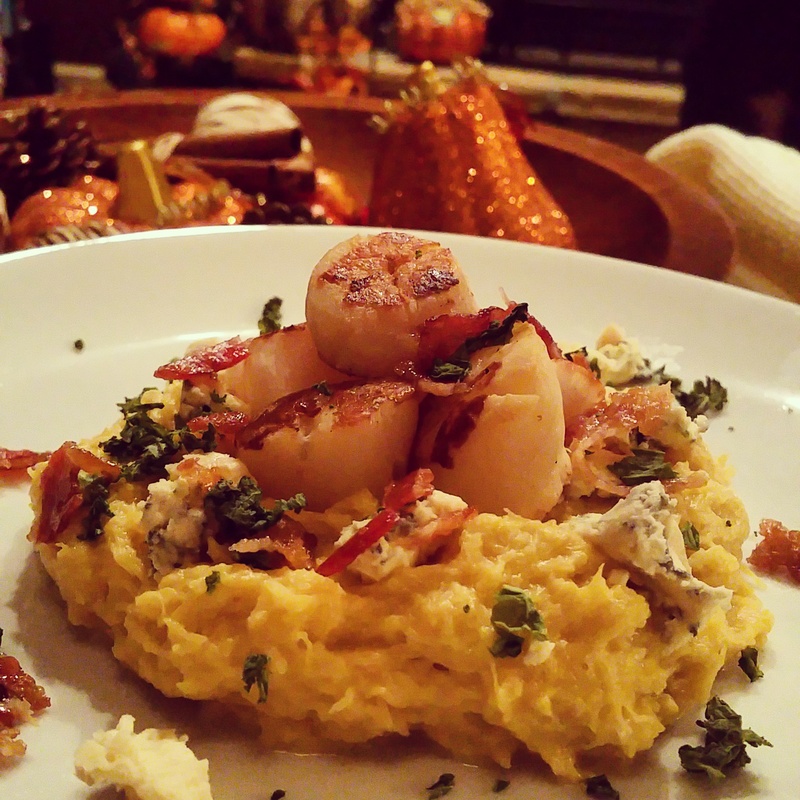 To serve, place a serving of squash on the plate, sprinkle with blue cheese, then top with scallops and candied bacon. 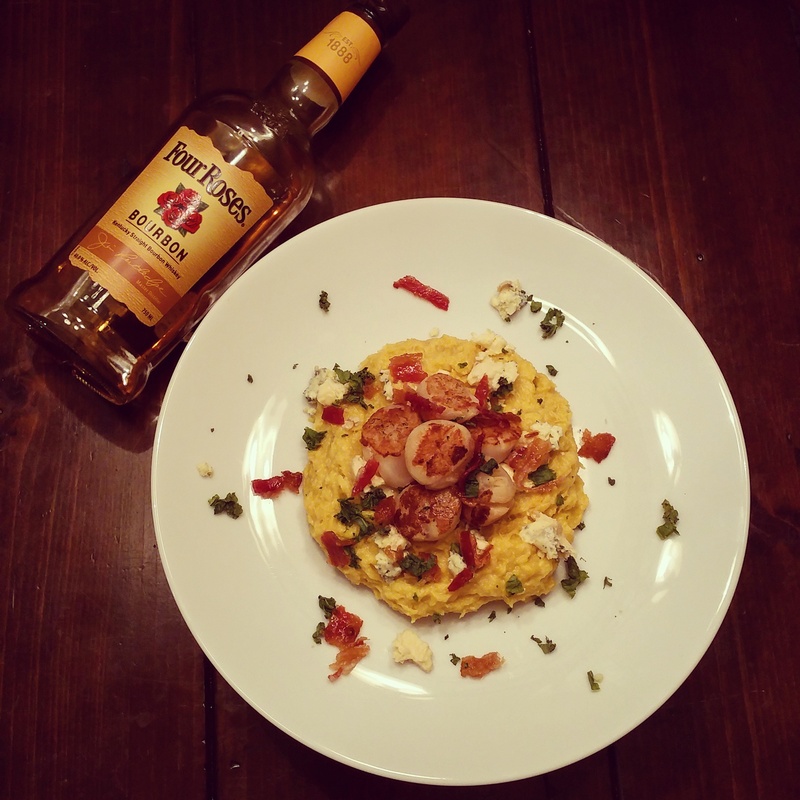 *A very special thank you to Four Roses Bourbon for providing a lovely bottle of Yellow Label Bourbon for this recipe along with other ingredients. 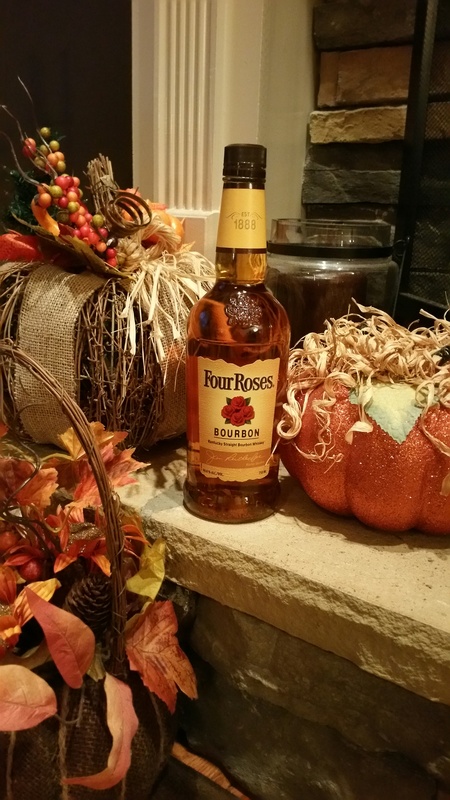 It’s great to come home for the holidays with Four Roses. Four Roses began when Paul Jones, Jr., the founder of Four Roses Bourbon, became smitten by the beauty of a Southern belle. It is said that he sent a proposal to her, and she replied that if her answer were “Yes,” she would wear a corsage of roses on her gown to the upcoming grand ball. Paul Jones waited for her answer excitedly on that night of the grand ball…when she arrived in her beautiful gown, she wore a corsage of four red roses. 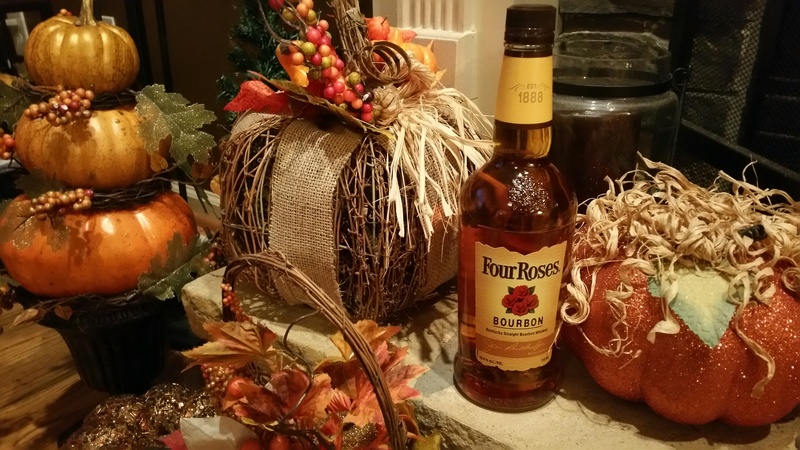 He later named his Bourbon “Four Roses” as a symbol of his devout passion for the lovely belle, a passion he thereafter transferred to making his beloved Four Roses Bourbon. For more information on Four Roses Bourbon, please visit http://fourrosesbourbon.com/, and remember to drink responsibly.